New build video is up on my YouTube channel. This video explains how to make a one-piece DIY concrete waterfall countertop with an inlaid river of flowing LEDs that cascades over the waterfall edge (using neopixel LED strips). This is the first of two videos for a mancave makeover at a friend's house. Part 2 will be uploaded within the next week, and will show how to make and install a reclaimed wood feature wall with floating LED TV panel, and the installation of the cabinets. The countertop is made from a glass-fiber reinforced concrete (GFRC) concrete mix, which is pre-cast in a melamine form. I made the mix from scratch (recipe links are below). I mixed 280 lbs of the dry materials (including powdered pigment) all at once, so the color would be consistent. I used 40 lbs for the face coat, and the remaining in batches for the back coat with glass fibers. I used an off-the-shelf LED controller that has MUSIC REACTIVE modes, chasing modes, and solid color modes, with an RF remote, to control the WS2812 LED strips. The LEDs are covered by a smoke grey transparent acrylic sheet, which is inlaid so it sits flush with the concrete countertop. 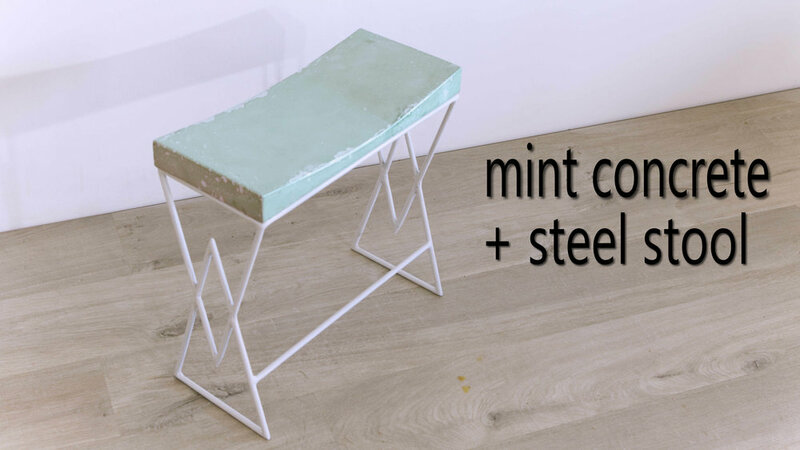 How to Turn Concrete into MARBLE -- new Table Build Video is Up! New Build video is up! In this video I show how to make a DIY concrete coffee table top look like marble. The top is made using Fishstone’s glass fiber reinforced concrete (GFRC) ready-made concrete mix, which is pre-cast in a melamine form. I separated out batches of different colored concrete (from white to dark grey), mixed them together in the form, and then swirled them together by hand to get the marble-like appearance. I also used an ancient Japanese technique called “Shou Sugi Ban” to make the base for the coffee table. I used a modernized version of shou sugi ban, employing a propane torch to char the outside of the wood. The charred wood is natural way of protecting the rest of the wood, and when finished with a penetrating oil, such as Danish oil, provides a durable surface. This technique works well on any open-grained wood, such as Douglas fir, pine, and cedar. I used inexpensive 4x4 Douglas fir lumber from my local big box store. The Cutting Bored just uploaded a video of their concrete and live-edge inlay charcuterie board. (I'm trying to resist saying its a cutting board by the Cutting Bored :) ) The video indicates this board was inspired by my live-edge table build video, but this is really a unique twist on the design. They used inexpensive materials and still got a great looking result. Generally, The Cutting Bored has a great YouTube channel going, so check out the rest of their videos as well, and show some love by subscribing. 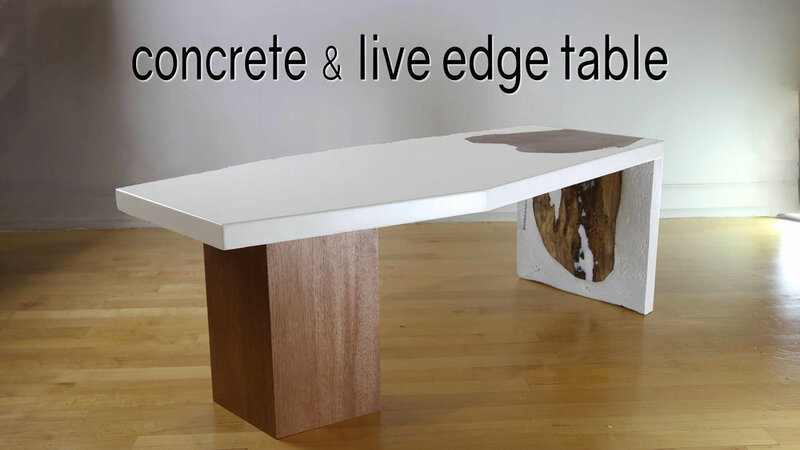 For those that missed it, here is the original live-edge white concrete table that the Cutting Bored references in their video. I created this cantilevered coffee table from a live-edge spalted maple slab and concrete. The angled concrete post was formed by slicing two sections from a standard 12" concrete form tube with a 15 degree angle, attaching these sections to the live edge slab, and pouring the concrete through the slab to form a solid post base extending through the table top. To cut the 12” concrete forming tube at a 15 degree angle, I created a 12” miter box from scrap plywood. I again used a white glass-fiber reinforced concrete (GFRC) concrete mix, and this time, poured in the face coat for the table surface. For the backer mix, I used plasticizer to make a self-consolidating (SCC) type of GFRC. Also, check out my Modustrial Maker website and subscribe to its RSS feed. I will be updating the website to include photos and details of past projects that were completed before I started documenting my work with video for this channel, as well as supplemental content on current and future projects.